Although their campaign has concluded, if you would still like to make a donation to support Pitt Men's Rugby, you may always do so here. 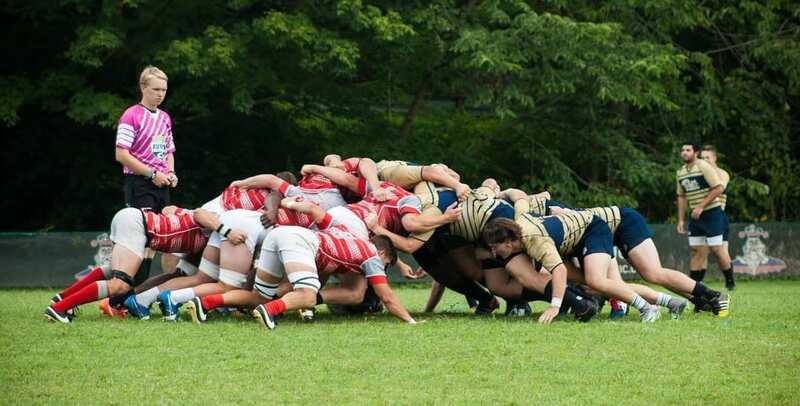 The University of Pittsburgh Men’s Rugby Club is an elite athletic organization competing at the NCAA D1-AA level. We are members of the Mid-Atlantic Rugby Conference and our 15’s and 7’s teams compete year-round for their respective championships in this talented conference. When we aren’t battling out intense conference matches, we travel the country entering national tournaments where we have the opportunity to play some of the best college rugby sides in North America. As members of the MARC, we devote all our time in the fall season competing for the MARC championship title. In the spring, we look to travel to and participate in various prestigious annual tournaments across the United States. Historically our team has performed extremely well in the tournaments we enter, however due to high entry fees and travel costs we are limited in the number of competitions we can afford to travel to. It is for this reason we ask the friends, family, and alumni of our team to support our goal of attending as many events as possible and help us continue to play the game that we love. To those who choose to support our club with a tax-deductible donation, 100% of the funds we raise through this campaign will be put towards travel and entry costs for rugby games and tournaments. We love this sport and we are immensely grateful to all those who support us, both through donations and through cheering us on and following our team. From all the members of the Pitt RFC we’d like to say thank you to everyone who supports us and for all that you do to help us continue to compete. Hail to Pitt! While our club is primarily focused on 15’s competitions, we also field and support a highly competitive 7’s squad. The National Sevens Tournament in Las Vegas is one of the largest rugby events in North America, and features teams from the NCAA all the way up to the national level. The opportunity to compete on this stage is a tremendous honor, and we hope to send our talented 7’s side to showcase our brand of rugby at the national level. One of the many tournaments we have been forced to forgo in years past, Nash Bash is unique in that it draws teams from a much larger area than our local region. We are always looking for opportunities to play great rugby teams, and we’re hoping we can afford to make the trip down to Nashville and participate in this amazing celebration of our sport. 52nd Cherry Blossom Tournament – Washington D.C.
Another premier rugby tournament, hosted by the Washington RFC, which is attended by a number of elite, varsity-level teams. While we did make the trip out last year, we were not able to travel with our full team due to travel costs. We’re hoping to make a return to D.C. this spring at full strength at have a run at winning against a strong field of competition. Last February, the Pitt Men’s RFC went undefeated to win the 2017 Frostbite Tournament. While the tournament almost always lives up to its name, with temperatures dipping below zero, we still aim to return to Landisville this year to defend our title and cement Pitt Rugby’s legacy in this local competition. As a non-varsity club, we primarily travel by car to most of our games and tournaments. This level of donation buys a tank of gas to help us get to our games. Thank you! This level of donation feeds three backs (or one forward) over the course of a long weekend tournament. Much appreciated! This level of donation pays for a hotel room that accommodates our players overnight at any one of our tournaments. Many thanks! This level of donation helps us pay the entry fee into one of the many of the tournaments we would like to participate in. We greatly appreciate such a generous donation! This level of donation buys one of our players a plane ticket to Las Vegas! Thank you for your incredible support! This level of donation would cover the accommodations of our entire 22-man squad over the course of a tournament! We are extremely grateful for such an unbelievable amount of support!